You know probably that Google Chrome is supporting extensions just like Firefox or the Opera browser. Extensions add functionality to the browser or modify the default behavior which can be quite useful at times. From ad blocking to scanning web pages or sharing information you come across. When you check the Chrome Task Manager, you will notice that many of the extensions that you have installed run all the time. You can open the Task Manager with a tap on Shift-Esc or by clicking n the Hamburger menu icon, selecting More Tools > Task Manager. The Task Manager displays the memory and cpu use of browser processes. This includes the core browser engine, all open tabs, extension processes, plugins, and the gpu process. You can select tasks here to end them. This is only possible for tasks that are not essential. While you can close tabs this way and kill extensions, it is not possible to kill the main browser task this way. As you can see on the screenshot above, the Google Cast extension uses about 19 Megabyte of memory. It needs to be noted that it was not in use at all at the time of the screenshot. Google tried to address the issue back in 2012 when it launched Event Pages, but the feature does not appear to have taken off after all. One way to verify that the extension is indeed using memory at the time is to open the task manager of the system as well. Windows users can use Ctrl-Shift-Esc to do so. Now, end the extension process and monitor the chrome processes. If one exits at the same time that uses about the same amount of memory, you have confirmed that the extension uses memory. If your computer has lots of memory you don't have anything to worry about. If it is running low on memory however, you may want to consider dealing with those extensions to free some up for more important tasks. While there may be extensions that you want to run all the time, an ad blocker or security extension for example, there may be some that you don't require all the time or only on select web pages. It is possible to enable or disable extensions using the extensions manager of the browser, but that is not really that comfortable unless you don't do this often. To do so visit chrome://extensions/ and uncheck the enabled box next to the extension. You can bookmark that page for faster access. A better option may be an extensions manager. While this adds a running task to Chrome, it may help you provided that you free up more memory than it uses when you disable extensions. SimpleExtManager is one of those extensions. 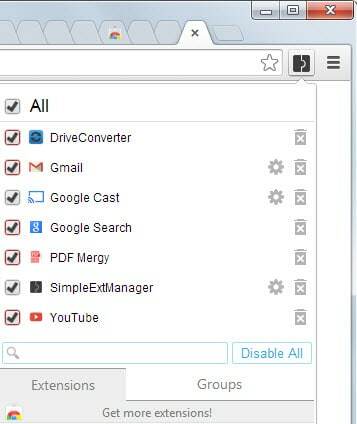 It enables you to disable and enable Chrome extensions, themes and apps with two clicks of the mouse. Its group feature allows you to group multiple extensions so that you can disable or enable them all with a single click in the interface it makes available. Again, using this extension makes sense only when you use it to disable multiple extensions as it uses memory of its own all the time while it is enabled in Chrome. Now You: Are you a Chrome user? How much memory are the extensions installed in your version of Chrome using? Google Chrome extensions use memory all the time while they are enabled. Find out how to free up memory in the browser. does this applies to firefox as well. Whitelisting makes this more comfortable, agreed! Google is forcing philosophy “one extension per feature”, meaning that big ones with lots of features are not desirable. Every extension, even the simplest one is using about 10 MB minimum, and that accumulates over time if extension have content script (must be injected into every page and with every reload). I’m not sure how it is with extensions, but with apps memory is purged 10 seconds after the app is closed (chrome packaged app that is). I’m not suggesting to kill extensions, but to disable them when they are not in use. Ideally, an extension would be created that would automate the process or at least whitelist extensions so that they run only if select sites are open. Just wanted to say that SimpleExtManager and the other 5 ‘Simple’ extensions all use Event Pages. They only stay in memory when needed, not all the time. Thanks for the “Simple” extension. Love it.